I Went On Vacation- Almost By Myself! We had planned a family vacation to Fargo awhile back, and then the Air Force canceled it, as they are wont to do. So when my husband came home from work about two weeks ago and said he was taking leave, and then asked me if I wanted to go to Fargo, I said yes. . .but I wanted to go by myself! He was very supportive of me taking a vacation (we both knew I needed it), and we decided that I would take just Maggie and have a girl road trip. It was so nice to sit down, and stay sitting down for as long as I wanted. It was great to hear quiet and not automatically assume that someone was shredding curtains or setting the carpet on fire. I ate meals without popping up and down ten times trying to take care of everyone else while my food got cold. 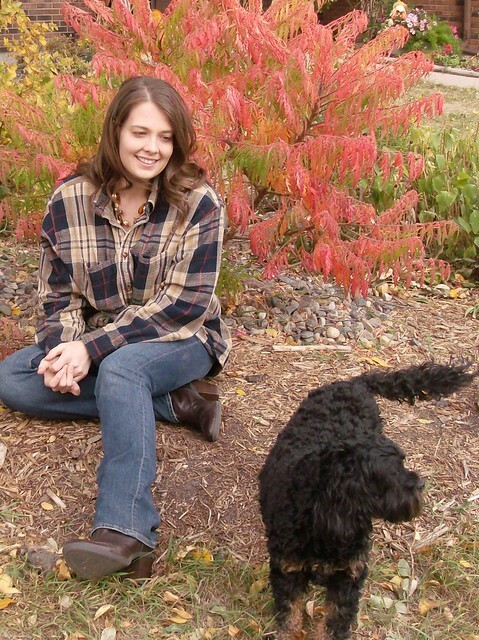 Maggie is easy, entertains herself for the most part and completely enjoyed her break from reality as well. I loved shopping with people who were patient, walked at the pace of normal human beings, and never screamed hysterically for a treat. Heck, I loved shopping in general, simply because Fargo has pretty decent options when it comes to clothes shopping and I had all my favorite stores at my fingertips! It was beautiful. I visited a few friends, but mostly just hung out with my parents and did nothing, which is just what the doctor ordered. We did have one grand adventure when we drove out to Bluebird Gardens, a really cool Farm co-op my parents participate in. 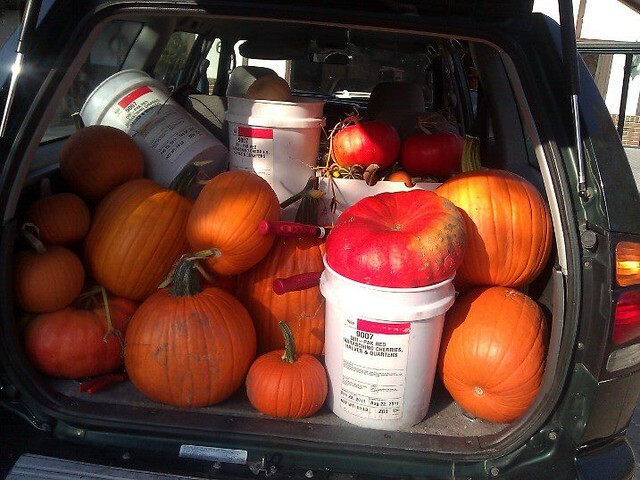 We harvested pumpkins, lugged them out of the field ourselves and loaded up my car with A LOT to take home. I ran out of room in the back- good thing I only brought one kid with me! 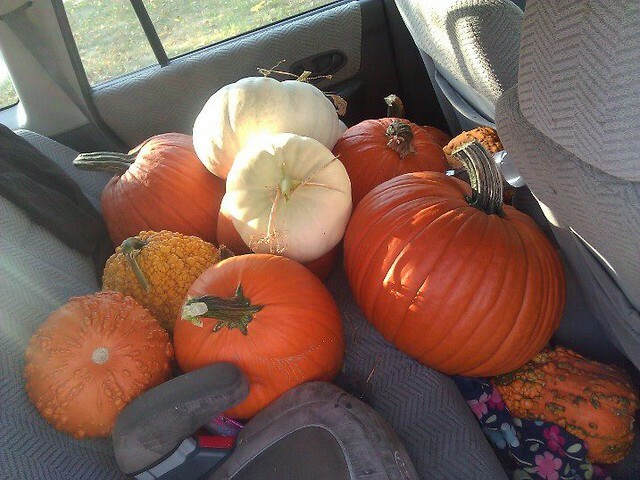 Confession: I love pumpkins. And not a little. 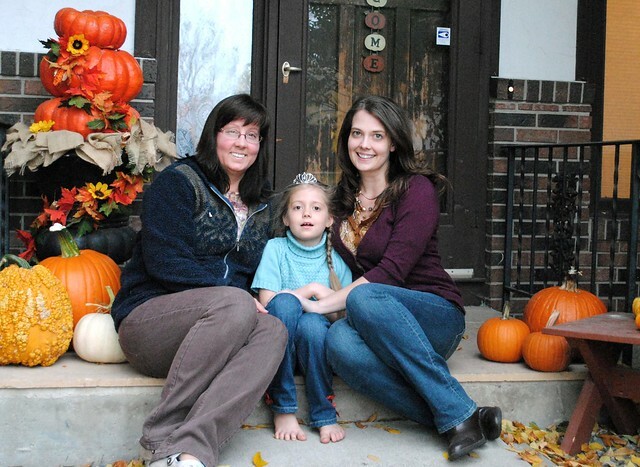 Very little in nature makes me happy like Autumn and Pumpkins- and boy did Fargo deliver a gorgeous fall! Isn't that a super cool bush behind me? What gorgeous color! Now I am home, and getting back into the swing of things. Gabe has barely moved from my side since I walked in the door. All is well at home, and Chris did an amazing job making sure everyone was happy and fed. Astonishingly, the house wasn’t completely destroyed when I got home. I wonder if he’ll let me do this every year? Sounds like fun. How is the dog dealing with the new little ones? I bet he’s loving the extra love. That sounds wonderful! I took a trip with just Lily back in January to visit some friends in California for a few days and it was so nice to have that break. So awesome! I hope you didnt feel too guilty as i always do. Moms need time out too but so hard to let go and actually trust things will be ok. I love all the pumpkins and gourds, so pretty. What a wonderful example for Maggie to experience, she probably felt like a queen. Hope getting back into the swing of things wasnt too painful. Big props to Chris for helping you enjoy this very special gift.